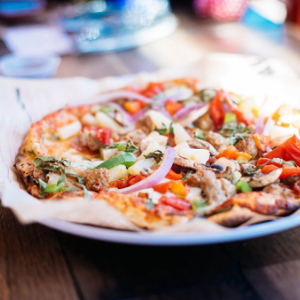 Conveniently located on Debo Drive near Walgreens, our Carolina Forest MOD Pizza is the perfect restaurant when you want something delicious in a hurry. Select from DIY individual-sized pizzas and salads with your choice of 30+ artisan toppings. Watch as it’s made fresh right in front of you – and ready in just minutes. Come visit us for lunch or dinner today! We support local schools and nonprofits through fundraisers and donations all year, along with our annual Spreading MODness campaign in November. Our Carolina Forest MOD has partnered with Children’s Chance, an organization whose mission is to improve the quality of life for children and families who are dealing with the trauma of pediatric cancer. Find out how MOD can support your organization or charity here.